Orders totalling £100 or more will receive an automatic 10% discount at the checkout. Baigent (A.F. ): My Garden Dials etc. Fixed Dial Listings, England. 12 pages, 1991. Fixed Dial Listings, Scotland. 13 pages, 1991. Fixed Dial Locations, England and Wales. 18 pages, 2nd edition, 1992. 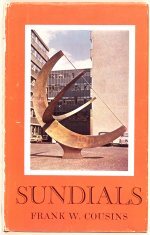 Cumbrian Sundials No More. 4 pages, 1992. Cumbrian Sundials. 6 pages, 1992.